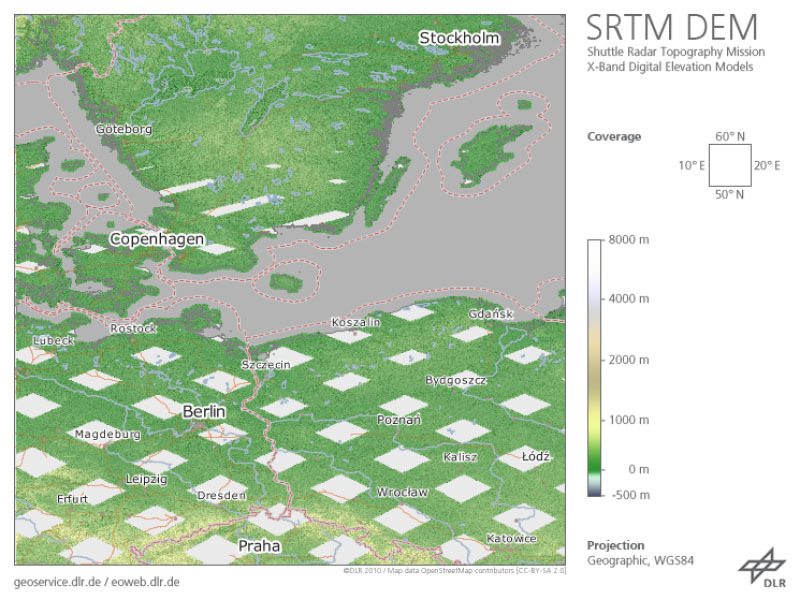 The Shuttle Radar Topography Mission (SRTM, DTS-99) from February 11 to 22, 2000 was an US-German-Italian effort to produce a first global digital elevation model (DEM). The German Aerospace Center (DLR) and the Italian Space Agency (ASI) complemented the US C-band Synthetic Aperture Radar (SAR) payload of NASA/JPL with an additional X-SAR instrument. The SRTM X-SAR DEM was generated at DLR from this instrument’s data using radar interferometry technique. The data was acquired simultaneously from aboard the Space Shuttle Endeavor employing two SAR antennas, one inside the Space Shuttle’s cargo bay, the other at the end of a 60 m extension pole. A substantial portion of the global land surface between 60° northern and 58° southern latitude was covered. As the orbit flown and imaging period of the SRTM mission had been optimized for the US C-band system, the German-Italian X-SAR with narrower aperture angle imaged data only along roughly 50 km wide orbital ground traces. Therefore, the dataset available shows a grid-like coverage. The original SRTM X-SAR DTED DEMs have been merged to 10° by 10° tiles, converted to GeoTIFF format and packaged into zip-archives. Each zip-file contains the DEM dataset, the corresponding height error map (HEM), a quicklook png-image, a kml-overlay and a readme document. The filename of the zip-archive specifies the bottom left coordinate of each tile. The zip-archives can be downloaded via the EOC Download Service. Nutzungseinschränkungen: Das DLR ist nicht haftbar für Schäden, die sich aus der Nutzung ergeben. / Use Limitations: DLR not liable for damage resulting from use. Keep Ctrl pressed to select Bounding Box.